Doug: They are all corrupt! The gov shutdown is because the senate refuses to remove a 72 percent subsidy for federal employees and exemption from health care for themselves. At the same time the GOP is making backdoor deals to exempt themselves also. They are all liars n covering there own self interest at the public’s expense. Me: We could argue the “they are all corrupt” trope a thousand times over but the real reason we’re at a shutdown is because House Republicans have tried to pass through legislative back channels an anti-Obamacare provision that they have failed to move either through House votes the 41 times they’ve attempted to repeal the ACA (Obamacare), through the Supreme Court, which upheld the law’s constitutionality, or through the election of 2012 when Mitt Romney advocated defunding Obamacare over and over and lost. It’s a law, and by attaching its defunding to a budget, the GOP is sidelining the legislative process. The 72 percent subsidy wasn’t even brought up until the day of the shutdown. Before that they were asking for a full repeal of the law. And when they saw that wasn’t going to happen they changed their demand to a 1 year delay plus a laundry list of other demands they failed to pass legislatively. 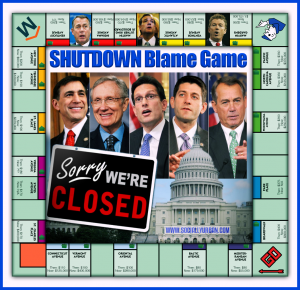 I’m all for assigning blame equally when it’s due but this government shutdown is purely the fault of the far right tea party republicans. Doug: Partially correct! Yes they have tried to defund. Yes its law. We agree! Yet, against the law itself the administration has changed it 12 times giving perks to whoever speaks the loudest. The final bill sent by house only ask, why are all these groups being exempted if we are mandated. Those changes were added after the supreme court ruled. How can anyone defend a lawmaker imposing a law on us that does not apply to them. Its in the details. This law wasn’t even about healthcare. That was the bait to get the vote. Its the single largest shift in power to the executive branch in history. Its a bad bill but suits the need at the moment. It was lies! U cant keep ur doc( or wont be able to in three years) and its not cheap and affordable. Thats not republican or democrat. Thats just whats happening. Very few that can be trusted on either side. I appreciate your opinion though. You very informed which most people arent. Me: We switched from arguing the cause of the shutdown to the merits of the arguments of the reason the shutdown happened. So I’ll take that to mean you agree that the Senate is not the cause afterall . I understand your concerns with the ACA and I also understand why you think there are problems with exemptions. But I think it’s too soon to make leaps and assumptions. If the law is horrible and does everything opponents are predicting then it will die under it’s own weight. But those who are actively working to undermine it (tea party republicans) just because they do not like the man in the white house is wrong.